Ugh. I'm already behind on here! I had good intentions, but then I got (re)addicted to scrapbooking! Anyway - Bart got his first flock of turkeys last Friday. But the action really started Thursday. Thursday - The birds need to be kept at a toasty 85 degrees. And normally, they like to take 24 hours to heat up the building and adjust the stoves to the right temp. So, Bart, Noel (Circle Hill) and William (Circle Hill's best employee) came out to fire up the stoves and make sure the building was all ready for the poults. And the stoves didn't work. Well, some of them worked, but some didn't. Some of them were losing juice up the cable that suspended them, and the cables were melting the pulleys. Cool, huh? So - frantic calls to the electricians and manufacturer ensued. The electricians came and by afternoon, had determined that they wired a few stoves wrong, which screwed up the rest of them, too. So...some frantic re-wiring took place, Noel declared he was going home to drink a bottle of wine, and we all hoped for the best. Friday - We unloaded poults at 7 AM. Bart went out there at about 5:30 to finish getting ready, and his dad came out to help, too. William, his wife Beth, and Noel were also there. Adam usually wakes up between 6 and 6:30, so I thought we'd have plenty of time to get out there. But, at 6:52, he finally woke up. I looked at the clock, sat up, and said, "Holy ****! 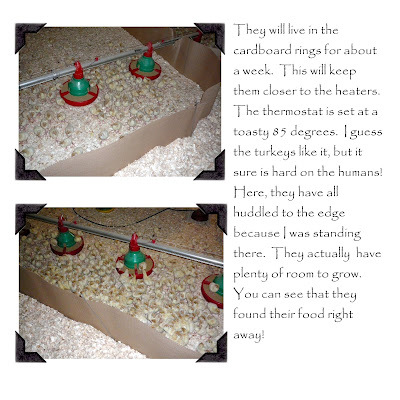 The turkeys are coming!" I nursed him for about 20 seconds, grabbed some crackers, and we took off. Just as we came outside, the semi was pulling in the driveway. So I changed his diaper as he sat in the stroller, and watched/helped them unload. 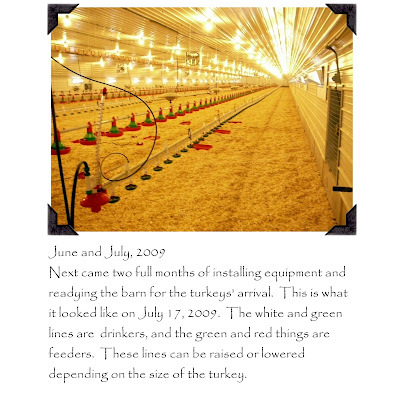 The turkeys come in crates that hold 100. The crates are divided into fourths, so there are 25 in each section. Dave (Bart's dad) and William stacked crates on the bucked of the skid steer, and Bart backed it down the length of the building. We (mostly Noel and Beth) unloaded the crates and put the turkeys in the rings. Then we stacked up the crates while the other three went back to the front of the building to get another load. 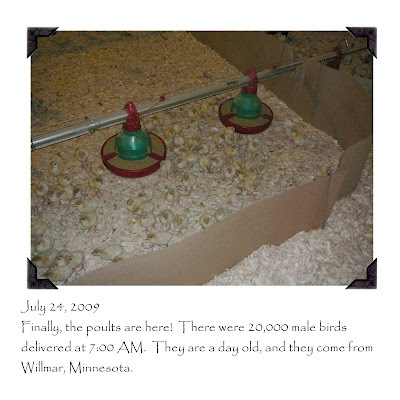 All in all, it took about an hour to unload 20,000 birds. The rest of the day went pretty smoothly. I went and got doughnuts for our crew (note to self - provide breakfast next time) and Bart spent most of the day outside with his little birdies, adjusting stoves and so on. It was a hot day - getting up to about 95 degrees. Then, in the evening, a cold front came through, and the temp dropped quickly. Bart came inside from about 8:30 to 10:30, and sometime in that 2 hour time span, the turkeys decided to huddle. Our theory is that the temp drop screwed up the temp in the building, they got cold, and piled together to stay warm. So we (mostly Bart, but I took my turn, too) spent the next two days trying to break them of this habit. They were piling up in the corner and suffocating each other. We knew it was warm enough, so it must have just been a habit for them by that point. Bart walked around the building, scraping the cardboard and shushing them away. He would go out there for an hour or so, and then take a 30 minute break, all day long. Finally, Sunday, things got a lot better and Bart got a little rest. So far, we've lost more birds than we'd hoped to. But they (Noel and William) say that's "New Building Syndrom." There are always some kinks to work out. 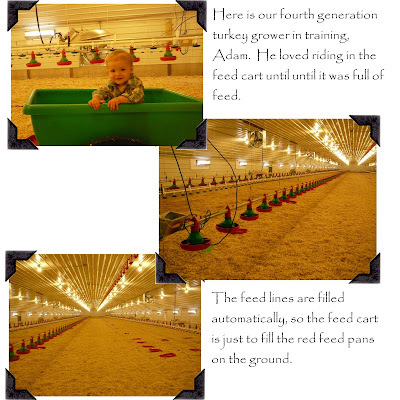 And now we have some room for improvement with our next flock! 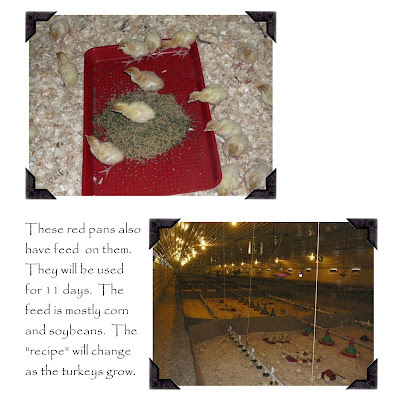 I'm making a book that explains the whole turkey farm. Here are some pages.